Shield Plug – Petersen Inc. 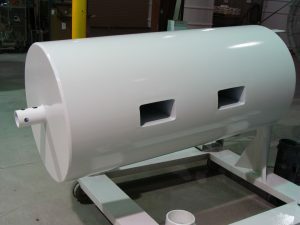 The shield plug is a companion product to the RLC, which is used with the Horizontal Emplacement Retrieval Equipment (also Petersen Inc produced). This product is put into the sidewall as extra shielding. The Shield Plug is a 3’ diameter X 6’ long cylinder (container) made from carbon steel and filled with concrete, and is manufactured under NQA-1 specifications. Due to the large quantities, Petersen Inc. built dedicated facilities with dedicated lines containing specialized tooling to support higher efficiency, repeatability and quality. Petersen Inc. is the only company able to manufacture this product in high volume.